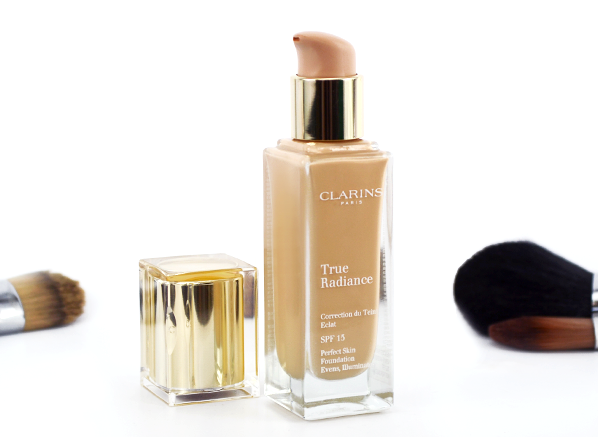 New for autumn and just in time for the AW14 trend for flawless skin, Clarins True Radiance Foundation has launched at Escentual.com. In a huge season for new foundation launches, True Radiance stands out as a real contender for the elusive “fuller coverage with a natural finish” crown. If you’re experiencing a slight feeling of deja vu, it’s because Clarins used to produce a highly popular foundation named True Radiance several years ago. That older formula was discontinued, and its place in the radiance-enhancing foundation category was filled by Skin Illusion (a firm favourite of mine). This relaunch of True Radiance with its brand new, luminous formula means that Skin Illusion is now positioned as Clarins’s “bare skin effect” foundation, whilst True Radiance provides fuller, more radiant coverage with its a “perfect skin effect”. I do believe Clarins has an instant hit on their hands. Lauded as the ultimate foundation for city living, True Radiance is predictably brilliant at balancing skincare and make-up know-how, something that Clarins does so well. As well as offering 24 hour hydration with Tara Gum and Samphire, the foundation contains an anti-pollution complex made up of Moringa Seed, White Tea and Succory Dock-Cress extracts, which help to shield against free radical damage and a loss of radiance. The main feature of this foundation, though, is its ability to provide skin with an immediate, healthy-looking and radiant glow. Though its coverage is medium to full, the clever complex of light magnifiers in the Radiance Booster Complex makes the foundation appear absolutely natural. Even the colour pigment is specifically shaped to optimise the reflection of light! The resulting coverage is pretty much perfect, in my opinion, offering a satin finish that blurs imperfections and evens out the skin’s tone. Fine, fluid and highly pigmented, the True Radiance Foundation glides across skin with ease and applies just as well warmed between hands and smoothed on as it does blended with a foundation brush or sponge, which is important for the busy (and the perpetually late). It’s a really tactile formula and it feels impeccably soft and comfortable once applied. 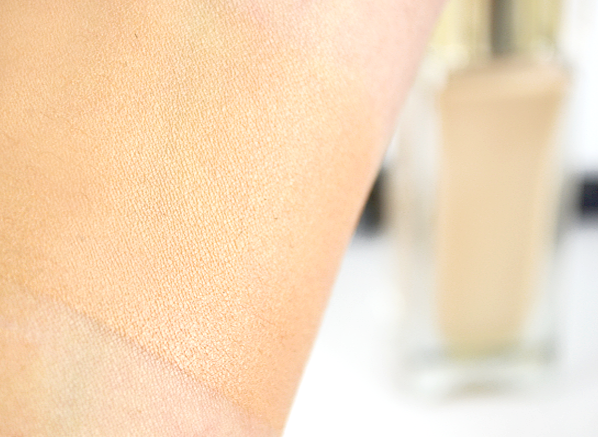 It’s an overused phrase, but it’s true – True Radiance feels like a second skin. One of my favourite things about Clarins foundations is that they go the distance without the need for touch-ups throughout the day. This formula takes it a step further. The pigments are coated in amino acids, which contributes to the aforementioned softness, whilst also ensuring enhanced make-up hold. Plus, it’s very lightly scented with cucumber, which is a gorgeous pick-me-up in the morning. The Clarins True Radiance Perfect Skin Foundation is available in 10 shades, which range from 102.5 Porcelain to 113 Cappuccino, and is presented in a beautiful 30ml glass bottle with pump. I have used this brush for 4 years, it's great but after using it every day decided I needed a new one, it's still great! This entry was posted on Thursday, August 7th, 2014 at 5:34 pm and is filed under Make-up, Swatches, Tried & Tested. You can follow any responses to this entry through the RSS 2.0 feed. You can skip to the end and leave a response. Pinging is currently not allowed.